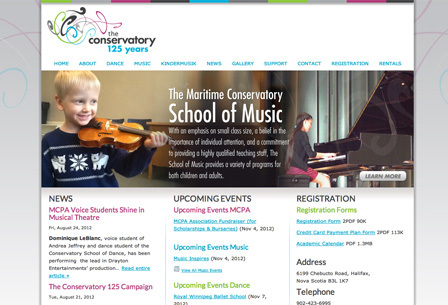 The Maritime Conservatory of Performing Arts, located in Halifax, Nova Scotia, offers an accessible and comprehensive program of dance and music instruction accommodating students of all ages and levels of ability. Our students receive a quality education designed to inspire a lifelong interest in the arts, whether for their personal enoyment or a professional carreer. The Conservatory had a website that needed a complete overhaul with the requirement to be easy to navigate and simple for them to update and maintain themsleves.